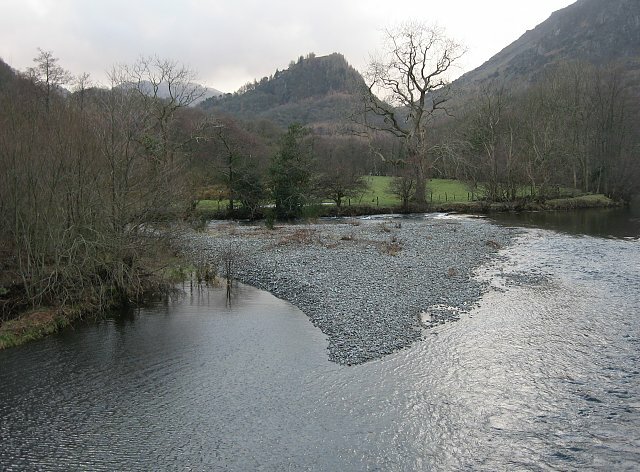 The Lake District Blog: The Jaws of Borrowdale ??? The Jaws of Borrowdale ??? In my last post about Seathwaite, reference was made to the Jaws of Borrowdale, located further down the valley. As you may remember, Wainwright described this specific area as the nicest square mile in the Lake District (a fact that I hadn't realised until I was corrected by one reader). As such, I thought it would be good to explore the Jaws of Borrowdale further in this post. I remember driving through Borrowdale for the first time in 2004. I had left the town of Keswick and passed the picturesque Derwent Water on my right. The road around here was narrow and winding, bordered by moss covered dry stone walls with woods or fields on the other side. It makes it way along the southern edge of, what is at that point, an open and wide valley floor. Once I passed the stone bridge near the turn off for the small village of Grange, the sides of the valley gradually started to close in on both sides. Then the road then cut through the side of a rock buttressed hill that rose above me on the left, as it went through a narrrow gorge with the river Derwent below me to the right. On the other side of the river, the valley rose steeply again, but this time to a craggy pyramid shaped peak with wooded slopes. This fell is Castle Crag, and the gap I was passing through is known as the Jaws of Borrowdale. Travelling through the Jaws of Borrowdale. Castle Crag can be seen across the River Derwent on the right. Soon the valley widened out again as I drove beside farmers fields and passed through small picturesque villages. After the turn off to Seathwaite, the road started its ascent of the Honister Pass as I left the Borrowdale valley on my way to Buttermere. As you can see from the photograph below (which looks back down the Borrowdale Valley in the opposite direction to my journey), the Jaws of Borrowdale are formed by three fells which constrict the sides of the valley to form a gorge through which the river Derwent flows. Alfred Wainwight, author of the famous Pictorial Guides, writes of the natural beauty of the area inside the Jaws of Borrowdale. "The [area inside] has a special significance. 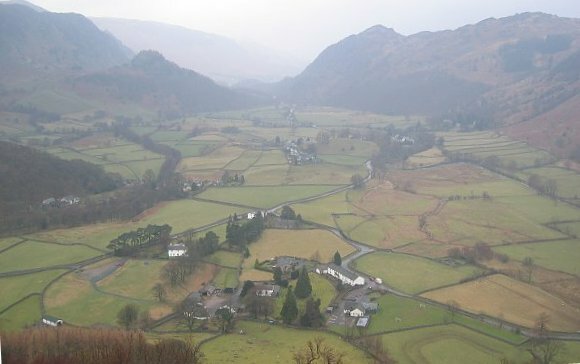 It encloses one mile of country containing no high mountain, no lake, no famous crag, no tarn; but in the authors humble submission, it encloses the loveliest square mile in Lakeland - the Jaws of Borrowdale." (A Wainwright - A Pictorial Guide to the Lakeland Fells: Volume 6. Chapter on Castle Crag). Inside the Loveliest Square mile in Lakeland. Castle Crag from the River Derwent at Grange. 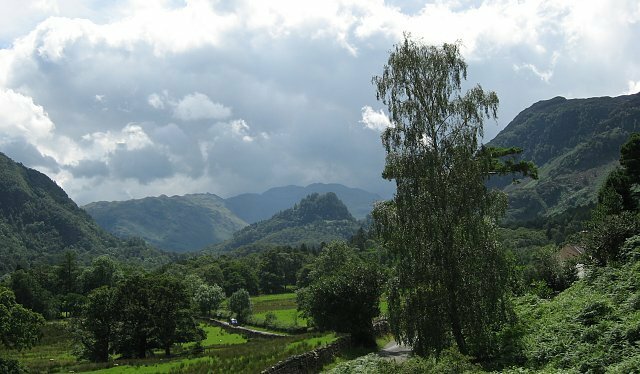 Castle Crag (Centre) by Anne Bowker. Anyway, if you think Borrowdale looks nice (which it is), just wait till you get to Buttermere!!! Welcome to the Lake District Blog. My name is Justin Farrell and I have set up this blog alongside my main website, english-lake-district.info. The purpose of this blog is to pick up on themes touched upon in the main website, and explore them in more detail.